Many companies are now focusing on getting the most out of customer data. This first led to personalising service and now to proactive service. 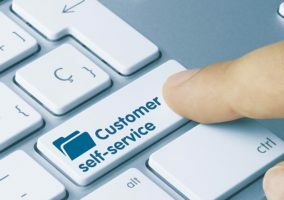 Why Is There a Focus on Proactive Customer Service? Customer retention is one of the reasons why certain companies are choosing to put greater focus on proactivity. This is because organisations can use proactive messages to direct customers onto a “journey” that has the greatest levels of satisfaction. 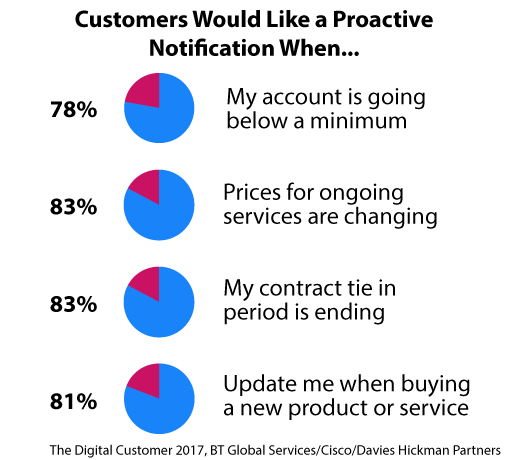 These proactive messages can be used to save customers who are on the verge of leaving, while this approach can also help to minimise distractions during the customer’s experience. This can help to lower effort along the journey. By lowering effort along the journey in this way, the organisation can simplify the customer experience, so customers don’t have to contact customer service later on. This is good practice because, as is often the case, the best service is no service. Arguably, the most basic form of proactive customer service is to follow up low satisfaction scores immediately. This may be with an apology message, like the one below, or a follow-up phone call. 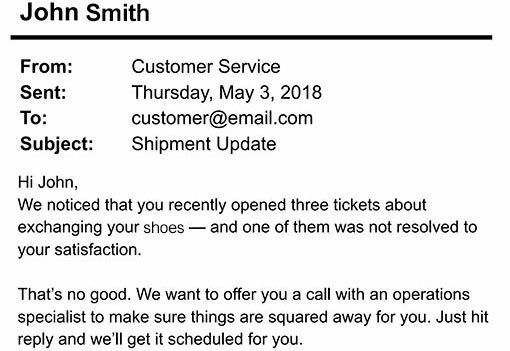 This message is an example of an automated message sent by a customer service tool. This tool is able to automate follow-ups across channels using tickets and Customer Satisfaction (CSat) results. It can also measure the effect of follow-ups on future tickets and satisfaction. But remember, at the heart of this proactive approach is a sincere apology. So, before you focus on the logistics of sending out the message, make sure you’ve got the wording right. Once a customer has left great customer feedback, you have an opportunity to boost sales through service with a well-timed promotional proactive message. Seize your opportunity by sending the customer a message and, if possible, offer them some sort of discount. This helps turn a great customer experience into a memorable customer experience. It is a shame when companies get great feedback and just leave it there. In time, customers will forget how great an experience was. So, occasional reminders – to high-CSat customers – may not go amiss. The next level of proactive customer service is all about anticipating customer needs and providing an answer, without advisor intervention, before a question is asked. So, it’s time to create rules based on the customer journey for when is best to intervene. Look for moments, perhaps through mystery shopping and listening to customer/advisor feedback, when a “guiding message” could be used well. 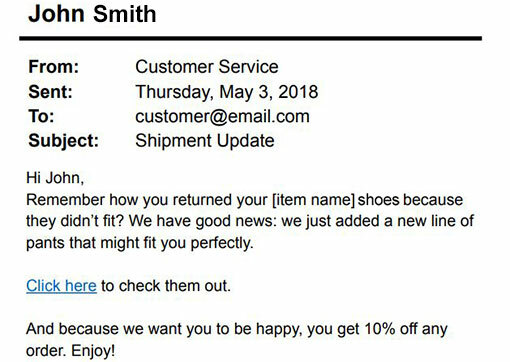 Messages like the one above when a delivery is later than expected demonstrate how proactive messages can lower customer effort, if used at the right times. 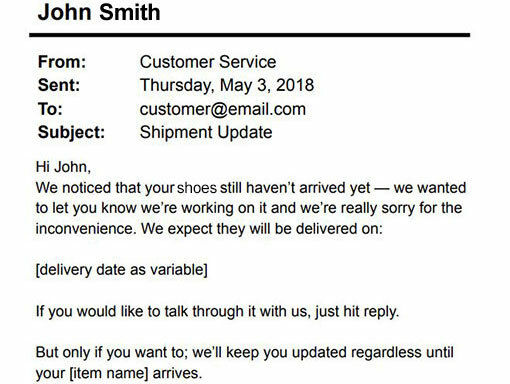 This example prevents customers from having to track their delivery, and find out the bad news for themselves. But don’t boil the ocean when it comes to this stuff. Adding too many proactivity messages at once can change the journey at an unmanageable rate. So, it might be best to make one change at a time and measure its impact. 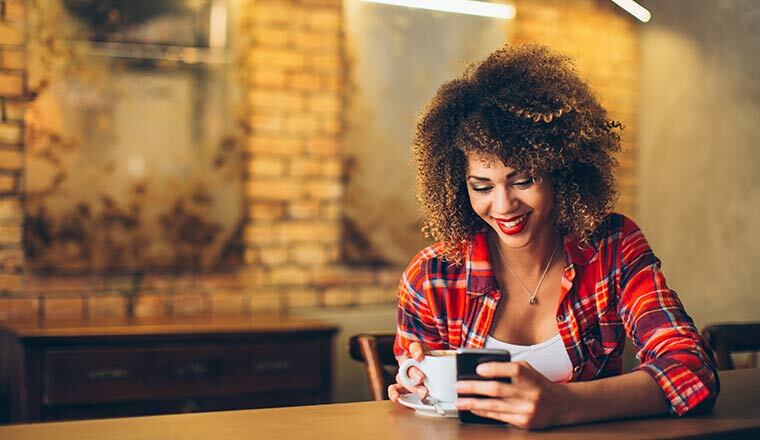 Pop-up messages to offer customer support are not revolutionary, but more is being done to ensure that they are used proactively, to appear at the most valuable time for the customer. A pop-up that appears too often can prove irritating, yet having the function there, to reassure customers and increase business, is advantageous. So, advanced companies are now using software to find the best times to do this. Software tools can detect when a customer has a high-value basket and is taking a long time to check out. In this scenario, an organisation can time a proactive pop-up to answer any questions that the high-value customer may have. For example, software tools can detect when a customer has a high-value basket and is taking a long time to check out. In this scenario, an organisation can time a proactive pop-up to answer any questions that the high-value customer may have – reassuring them of their decision, before they follow through on the purchase. However, these customers may also want to interact with the company in other ways. So some organisations instead use web widgets, which are pop-ups that include options for self-service (i.e. FAQ searches), requesting a call-back and the conventional live chat. It is old news that major companies present the content that is likely of most interest to the individual customer on the homepage of their website. Now, some companies are further personalising their websites and being proactive by using customer data and machine learning. For example, some organisations adapt their website depending on the location of the customer. This is not only in terms of language, from country to country, but also in terms of the amount of information given with each product/service. So, a product may be given a longer description in Japan or South Korea than in the UK or US, for instance, as they value this more. Also, by using AI, some companies are tracking where readers from different locations are moving their mouse (and therefore eyes) across the page. This gives companies the best idea of where to place their most valuable content. AI can be used analyse historical data and survey responses to determine when a customer is healthy, satisfied and ready to engage. Through this use of AI, organisations are combining support history with product history to target offers and encourage engagement, depending on predictions of the customer’s ‘status’. An example of a message of this kind is highlighted below. In theory, this should enable the organisation to retain customers and improve word of mouth. Remote asset monitoring can track the condition of certain electronic products – such as washing machines, for example. This tracking can alert the contact centre when the product needs repairing or replacing. Once the contact centre receives the alert, they can then send a proactive message to the customer. While this may seem extreme, advanced organisations are constantly trying to think of new innovations revolving around proactivity, and most involve AI. Although proactive customer service is still in its infancy for most organisations, there are two mistakes that some brands have fallen into, as highlighted below. Align the messaging of your contact centre with other departments in the organisation, like marketing, accounts and research. Customers don’t like to be overloaded with information, so it’s important to align the messaging of your contact centre with other departments in the organisation, like marketing, accounts and research. Why? Because if a customer has three pop-up emails on their phone from you in a week, for example, they will likely grow tired of your brand and send your messages to the spam folder. A vital “port” of contact is then lost. So, when creating a plan for proactive customer service, include other departments – especially marketing, with whom the contact centre should already have close links. These close links help to make sure the service delivered to customers is in line with their expectations, which largely come from marketing material. Proactive messaging should be used as a tool to save customers, not push them “over the edge”. Yet this is what could happen if you send the wrong messaging to dissatisfied customers. For example, if a customer has just made a complaint about the low quality of a product, don’t send them a promotional offer for that product. You may as well send them an advert for one of your competitors. So, have a category for dissatisfied customers within your messaging system. This category can then be excluded from any promotional mailings. 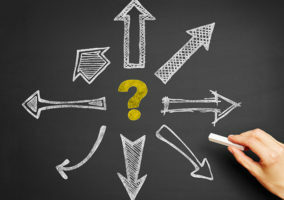 Are Customers Ready for Proactive Customer Service? This step includes sending little reminders that customers actually want to know. According to BT research, as highlighted below, most customers approve of this kind of proactive service. The problem then is when we use machine learning to become too predictive, to the extent where we can start to figure out what the customer wants before the customer knows they want it. This is where it can, for the moment, get a little creepy. This may certainly be the case in Europe, in this new era of GDPR, where we – as customers – can choose to say ‘no, I don’t want to share my data with you’. Yet, this level of proactivity hinges on data, so how do we trade data is becoming increasingly important, at a time when some companies are even using remote asset monitoring for proactive service (point 7).